So this whole adult coloring thing is huge, isn’t it? And while I kind of wonder why he feel the need to stick “adult” in front of it, like we think that it’s too immature a past-time unless we imply that we’re coloring something a bit more challenging than Snoopy laying on his house, I still stick that adult in there myself. The fact of the matter is that it’s pretty dang calming. You zone out and just worry about what color you’re going to fill in that next shape with. If you want to enjoy a real stress reliever coloring book, you may as well try one of our favorite apps – Coloring Book with Magic. Why carry around a book and coloring pencils, when you can have a real coloring book app right there in your Pockets? Coloring Book with Magic is a wonderful art journey with beautifully designed illustrations and drawings that you can color wherever you are, whenever you want. This adult coloring book app is a great anti-stress and relaxing activity that will definitely awake your imagination and creativity. Let’s see what it is all about. This coloring app is smoothly designed and optimized with drawings and artwork created by a talented digital illustration artist. It provides with more than 5 categories of stress relief coloring books that are regularly updated, over 20 amazing color palettes, daily images, and an option for you to print or share your creations with your friends and family. There is also a great coloring category for children! 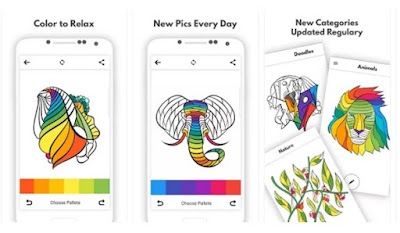 Recolor these stunning illustrations and create art of your own – download this anti-stress coloring book app for free from Google Play and enjoy!